Edmond Heatley’s Clayton County Manor Is In Uproar! The Peasants Have Distributed The Proverbial Pitchforks! They Are Storming The Castles! Where’s The Regular Media? Don’t Worry! This Is The Blog Revolt! Edmond Heatley Must Go! | Georgia Teachers Speak Out! ← Tornado Clayco Hits Jonesboro’s Fifth Avenue! Edmond Heatley’s Clayton County Manor Is In Uproar! The Peasants Have Distributed The Proverbial Pitchforks! They Are Storming The Castles! Where’s The Regular Media? Don’t Worry! This Is The Blog Revolt! Edmond Heatley Must Go! 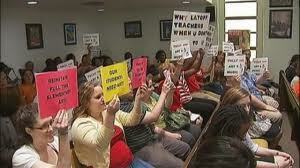 We Presume That It Just Depends On Who You Are…If You Are Allowed To Get Raucous At A Clayton County Board Meeting. When Dr. John Trotter Held Up Just One Sign In The Back Of The Room Without Blocking Anyone’s Vision, He Was Falsely Arrested (Charges Were Summarily Dropped). Hmm. Do You Suppose That The School Board Only Tries To Muffle Those Whom It Fears? NAACP President, Synamon Baldwin, Was Removed From The Room This Past Monday Night…For Going A Few Seconds Over The Allotted Time. Hmm. It’s always pick and choose about whom you are going to call out for going two seconds over or for raising decibel levels, as I have observed the action of the Clayton County Board of Education through the years. I understand that Sid Chapman of GAE-CCEA was allowed to stand up from his pew and speak to the school board, but that Pam Adamson called out a student who was addressing the school board and raised his decibel level. Of course, by now, we know that the school board gave its apparent imprimatur to the President of the local NAACP, Synamon Baldwin, being removed from the entire room for apparently going a few seconds over the allotted two minutes to speak. I have been informed that Ms. Baldwin wrote an email to Chairperson Pam Adamson, seeking a meeting with her and a copy of the security guidelines manual or something to this effect. She obviously wants to know why she was treated so rudely and brusquely. I remember watching a late night re-run of WSB-TV2‘s account of the fateful night in January of 2003 when The Nedra Ware Gang fired Superintendent Dan Colwell. (I had attended Sonny Perdue‘s Inaugural Ball and had not attended the school board meeting that night.) I watch then President of CCEA-GAE, Jeff Hubbard, and his cohorts screaming (literally screaming), “Cowards!” This was their response to the school board and its actions. They were screaming this to the school board right in the middle of the school board meeting. It was really a funny sight to behold. Guess what? I watched the Clayton County Police officers stand placidly and observe this screaming. I didn’t see nor did I hear about a single person being removed from the audience. Not the first. Hmm. I love consistency. Of course, later, Sid Chapman and CCEA fully embraced Nedra Ware and her main sidekick, Connie Kitchens, when they apparently joined GAE. Ha! Isn’t this too funny? Hey, Sid, check the GAE rolls, and I am quite confident that you will find their names still on the GAE rolls. Life is funny. For some strange reason, Sid Chapman is treated with kid gloves. (I presume because Sid is the “anti-MACE.” Ha!). I have never known Sid to help even one person get elected to the school board, and yet Pam Adamson and Alieka Anderson appear to want to kiss his political posterior. Or, is the feeling mutual? I have observed Sid and his CCEA group huffing and puffing like they have some influence in campaigns in Clayton County. Zilch. For example, they even refused to “endorse” their own member, Jessie Goree, but Ms. Goree won anyway, and she was fairly put out that her own union did not endorse her. They couldn’t seem to be able to keep Nedra Ware and Connie Kitchens in office either. (I think that CCEA even officially endorsed them.) These two dropped their MACE membership after I publicly called out them and others on the school board in early 2003. They must have joined GAE because I witnessed Sid Chapman metaphorically kissing their behinds at a school board meeting and publicly giving them gifts. When they were associated with me, I helped each one get them elected twice. Ha! “Helped”? Yes, it seems that I did virtually everything for them, including putting out signs in the hot, hot, hot days of summer. I haven’t seen ole Sid do much but blow off steam at a board meeting, resulting in zilch. By the way, why is ole Sid Chapman not teaching in the classroom? Presumably GAE-CCEA is still funneling monies through the Clayton County School System to the Teacher Retirement System (TRS) of Georgia, listing him as a teacher in the Clayton County School System. Will this school board do the same for other people who formerly taught in Clayton County? Hmm. Sounds like a good deal. Perhaps I should get in on this scheme! Hey Pam and Alieka, doesn’t this constitute fraud? In my humble estimation, this is fraudulent. If a person doesn’t still teach in the school system or is not still employed in the school system or is not drawing a check from the school system, how can the school system allow a union to flow money through it to TRS? Wouldn’t the school system have to vouch that this person is still a teacher in the school system? Does this make sense to anyone? But, what do I know? Maybe the lawyers have found a way to make this legal. Ha! On this particular issue, something in the milk ain’t clean. How can someone truly be independent in his or her criticism of the school board if he or she is dependent on the school board providing him or her with such a sweetheart deal? Didn’t Edmond Heatley sign a $1.4 million dollar contract with the Sheriff’s Department without prior school board approval? I think that he signed the contract in August of 2010, but only brought this to the school board in March of 2011. If I remember correctly, in 2007 or 2008, the Clayton County School Board limited a superintendent’s power to spend more than either $15,000 or $20,000 without prior school board approval. $1.4 million?! Is this Heatley fellow out of control or what? Yes, where is the media? A proverbial tornado blew the roof off of the Administration Building on Fifth Avenue, but where is the regular print or electronic media? What is Bonnie Pratt and the folk at the Clayton News/Daily doing? Counting their legal ads money? Their office is just a few blocks from the Clayton County Public Schools Central Office, yet we read nothing of what really took place on Monday night. No wonder hardly anyone buys these newspapers anymore. Heck, you can get more accurate portrayals of what took place from blogs. 2 Responses to Edmond Heatley’s Clayton County Manor Is In Uproar! The Peasants Have Distributed The Proverbial Pitchforks! They Are Storming The Castles! Where’s The Regular Media? Don’t Worry! This Is The Blog Revolt! Edmond Heatley Must Go! Well, Picked Pocket, if it is true that Superintendent Edmond Heatley signed a 1.4 million dollar SRO contract with Sheriff Kim Kimbrough’s office without prior school board approval, then ole Cali Man may be in a heap of trouble. The Public doesn’t play when it comes to playing with the Public’s money!